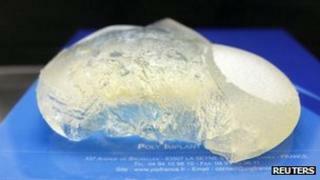 The French authorities have recommended that 30,000 women have faulty breast implants removed as a precaution. The government, which says there is no evidence of a cancer link, will cover the cost. The implants by French firm Poly Implant Prothese (PIP) were banned last year after they were found to contain a non-medical grade silicone filler. But the UK government ruled out routine removal, saying there was "no evidence" of a safety concern. Health Secretary Andrew Lansley said: "At the moment we are in a position where we have no evidence of a link to cancer. "We have no evidence of toxicity, we have no evidence of substantial difference in terms of ruptures of these implants compared to others. "So we don't have a safety concern that would be the basis for the routine removal of these implants." Chief Medical Officer Dame Sally Davies said women with PIP implants "should not be unduly worried". "We have no evidence of a link to cancer or an increased risk of rupture. If women are concerned they should speak to their surgeon," she said. "While we respect the French government's decision, no other country is taking similar steps because we currently have no evidence to support it." The UK medicines watchdog, the Medicines and Healthcare products Regulatory Authority (MHRA), said it recognised women's concerns. But it added in a statement: "We currently have no evidence of any increase in incidence of cancer associated with these implants and no evidence of any disproportionate rupture rates other than in France." It said France had reported rupture rates of around 5% for PIP implants, compared with 1% in the UK. The French health ministry said women with PIP implants did not have a higher risk of cancer than women with implants made by other companies, but said there were "well-established risks of ruptures". PIP used non-medical grade silicone believed to be made for mattresses, according to the British Association of Aesthetic Plastic Surgeons (BAAPS). This meant the low-cost devices were more likely to split. Consultant plastic surgeon and former BAAPS president Nigel Mercer said the French government's stance was "certainly not unreasonable". "The reality is that the industrial-grade silicone gel used in these implants was not meant for the human body," he said. "In some instances women who have no rupture of the devices will be happy to be monitored regularly, but others may wish for the PIPs to be removed, regardless of symptoms." "We would have preferred to sue PIP, obviously, but they are bankrupt so they have no money and no assets," lawyer Mark Harvey told Reuters. More than half of its exports went to South America, including to Venezuela, Colombia, Argentina and Chile. In Brazil, some 25,000 women are believed to have had the implants, the AFP news agency reports.